The birthday. The candles and cake. The WISH! Otto, on his sixth birthday, feels rather neglected. You see, one week earlier, he became a big brother. No longer the center of attention, Otto takes his birthday wish to heart and wishes his baby sister Anna was never born. In theory, you'd think a wish like that would set things like they were before. Not quite so, as Otto quickly learns. The wish makes time go backwards. Yes, Otto's parents take his sister back to the hospital. But backwards time doesn't stop there. Time continues to go in reverse. Otto, to his dismay, grows younger, smaller and more frantic as each former birthday passes and he desperately tries to set things right. Some picture books are pure fluff. This book is not and that is a good thing. 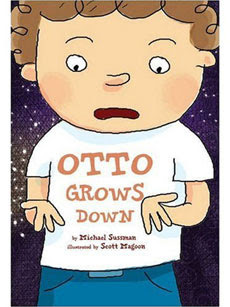 Otto Grows Down , the fascinating and funny children's book by Michael Sussman stretches the imagination. I can guarantee Sussman's book will make children think, particularly about jealousy and also the concept of time. Most kids with siblings will at some point develop feelings of resentment. Using humor, the book provides a good starting point for discussions with children about sibling rivalry. Otto feels awful about his wish and learns a valuable lesson, put best by the illustrator Magoon, "Otto grew up when he grew down." Besides the sibling rivalry slant, the book is very clever in other ways as well. While talks about jealousy are helpful, my preschool daughter found the fantasy of time moving backwards most intriguing. Before reading the book to her, I must admit to wondering whether she would grasp the concept or get scared about time in reverse. After a little explanation she so totally got it and loved the pretend aspect. In fact, she wants to keep talking about time moving backwards. So much so, that we've read the book nearly every single day. Her favorite parts of the book include the illustration of the wristwatch hands going the wrong direction and the bathroom scene. (Fair warning, the book contains a small bit of potty humor, something that all children seem to love.) The other clever point? Teachers and parents should find this book quite useful in teaching about palindromes -- words or phrases that read the same way backward or forward. All the names of the characters in the book are palindromes: Otto, Anna, Bob, Mom and Dad. Scott Magoon's mostly dark, cartoonish illustrations bring feeling to the story. His use of color helps display Otto's emotion, with muted blacks and grays showing his discontentedness and love inspired orangish-red when events turn around. On a sidenote, I personally think Otto has worse problems than the birth of his sibling, namely his father's choice in clothing. His father seems to make a habit out of wearing Hawaiian shirts, sometimes paired with cardigan sweaters and plaid pants. Talk about embarrassing. I know what I'd be wishing for on my next birthday if I were Otto. Win a copy! Sterling Publishing has kindly offered to give one Brimful Curiosities reader a copy of Otto Grows Down. To enter, leave a comment with letting me know why you'd like to own this book. Additional entry! - Just for fun, visit Michael Sussman's website www.ottogrowsdown.com and let me know which palindrome is your favorite from his list (or make your own up). • Contest ends on Monday, April 13th, 2009 at 11:59 PM CST. I saw a review of this book yesterday - It looks so cute. I like the lesson of "Be careful what you wish for". I follow you in bloglines. This looks so cute. My grandaughter is getting ready to be a big sister after 6 years alone, so this may be the perfect book for her! I love "Go hang a salami, I'm a lasagna hog." My son LOVES books, so I'd love to win it for him. I actually have this book and LOVE it!!! I'd like another copy to give to Reagan for her birthday! I think this book looks really interesting and my son loves for me to read to him. I would love to win it for us. I work with kids- it'd be a fun book to share with them from the looks of it! I love Scott Magoon's work, and have yet to collect one. We'd love this! Can't get much better than "Yo! Banana boy!" I'm always looking for books that can capture both my 5 year old and 1 year olds attention. A picture book that isn't fluff is right up my alley. Count me in! I enjoyed the "Do geese see God? " I like "No Sir! Away! A papaya war is on!" I would love this book for my grandkids! I love to read to them. I love "yo! Banana Boy!" Awwww this book looks sweet! love.. No sir! Away! A papaya war is on! My grand sons would love this. My son would love this book! We are constantly talking about yesterdqay versus tomorrow and I think that this would help him! Quiet Bunny, this looks to be a sweet book. Thanks for the giveaway. I am a follower of you blog. That is def. my favorite palindrome from that page. My preschooler would love this book! This would be a great book to share with my two children! "No melon no lemon" makes me laugh! I'm sure that my daughter thinks about not having her brother anymore quite often. This would be a good story for our house. I'm a fan of "dumb mud". I'd love to have the book to share with my two boys --- I know they would love this. I like "Sit on a potato pan, Otis." My nephew would like this book! I'd love to win this book b/c it looks like it would be so much fun to read with my little one. I have heard reviews on this and think it would be perfect for my granddaughter. I like Rats live on no evil star. my son loves to read, and I love to read to him. we are always looking for fun new books to add to our library.